Adding a lining to made to measure curtains helps to protect the main fabric, allows curtains to hang well and of course is effective in filtering light. There are a number of options for lined curtains depending on exactly what you want to achieve, the room in which the curtains hang and to some extent the weight of the curtain fabric. It is worth highlighting that linings are a good idea not only for curtains but for roman blinds as well. Cotton lining will protect your curtains from the effects of sun and dirt. They also help curtains to hang well. 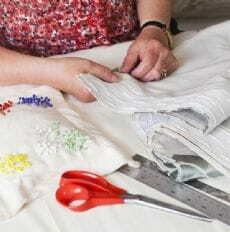 I stock cotton lining in ivory and white but can also obtain other colours if required. If you need to keep draughts and cold out and would like to save on the fuel bills by reducing energy loss, then thermal lined curtains are recommended. Despite their heat saving qualities, thermal lining is only marginally thicker than cotton lining and will allow curtains to hang just as well. I stock thermal lining in ivory. Blackout lined curtains have the same insulation qualities as thermal lined curtains but have an additional acrylic layer which has the effect of blocking out light. Blackout lining is most commonly used for bedroom curtains where you want to keep out as much light as possible. Especially good for children's rooms in the summer! Again I have blackout lining in ivory. For maximum thermal insulation and therefore energy saving, go for interlining as well as thermal lining. Interlining is a fleece-like fabric which is sandwiched between the curtain and lining fabric. It really does make a difference with windows where there may be drafts or a lot of noise and is particularly useful for door curtains. I stock Bump and Dormette interlining and can order Sarille.